Rosehill has decades of experience in wine cellar design and we are the foremost wine cellar construction experts in Toronto and across Ontario. We’ve been doing this work for decades, and we have specialized equipment and staff waiting to help create the most efficient, modern and aesthetically pleasing wine cellar possible in whatever space you have available. Rosehill has something for every oenophile. We provide would-be wine cellar owners with the versatility of modular racking or the permanence of made-to-order wine racks. We also consult on cellar designs and you may Contact Rosehill Wine Cellars at any stage in your project if you would like our experienced wine cellar designers to inspect your schematics and even show you what design they think would look best in your space. Let Rosehill Wine Cellars designers draft a custom layout for your home or business wine cellar. Custom, Premier Cru, and Modular Redrack designs are available. We can also design the space using the metal wine racks for a chic modern look. If you would like Rosehill to design your wine cellar then this form has everything we need to get started on your custom wine cellar design. Rosehill’s experienced designers are incredibly creative and consistently surprise clients by giving them fresh perspectives on their projects and showing them the amazing potential of their spaces. Then our construction wizards, with a shop full of specialized woodworking machinery at their backs, can almost effortlessly transform even the most technically demanding schematics into a breathtaking reality. Since 1995, our team has handcrafted hundreds of custom wine cellars in luxury homes and cottages and restaurants across southern Ontario. The process begins with consultation and design and ends with installation and final inspections. We can tailor and tweak your ideas, double existing capacity, improve aesthetics, and add extra efficiencies and ergonomic comforts. Rosehill Wine Cellars offers ongoing maintenance on all ventilation and cooling equipment, and our trusted brand usually becomes every wine cellar owner’s first choice for future amenities. Do you dream of a modern, traditional or ‘transitional’ wine cellar? Metal or wooden racks? Construct your wine cellar using our Premier Cru superior wine racking kit system in Beech wood, Sapele or Toasted Maple. The elegance is obvious on paper and breathtaking in the room. 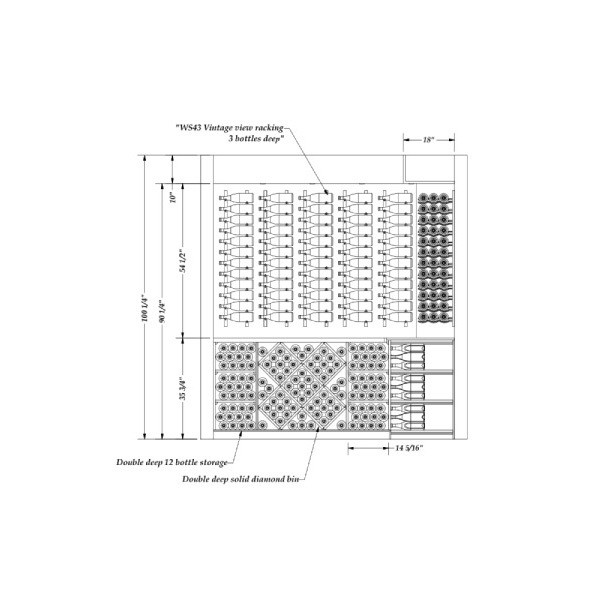 The wall mounted racks come in 6ft & 7ft heights (and can be cut to fit other spaces). These are the best quality kit wooden wine racks available in the marketplace today. Rosehill will create wine cellar layouts based on room dimensions and photographs. 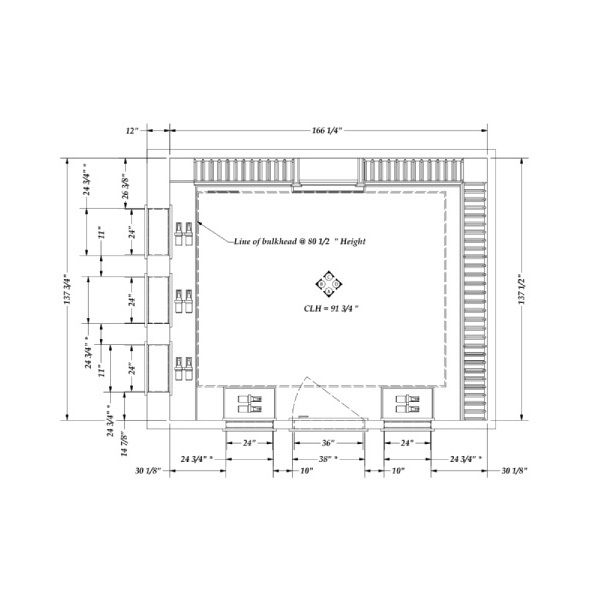 This form has everything we need to get started on your custom wine cellar design. 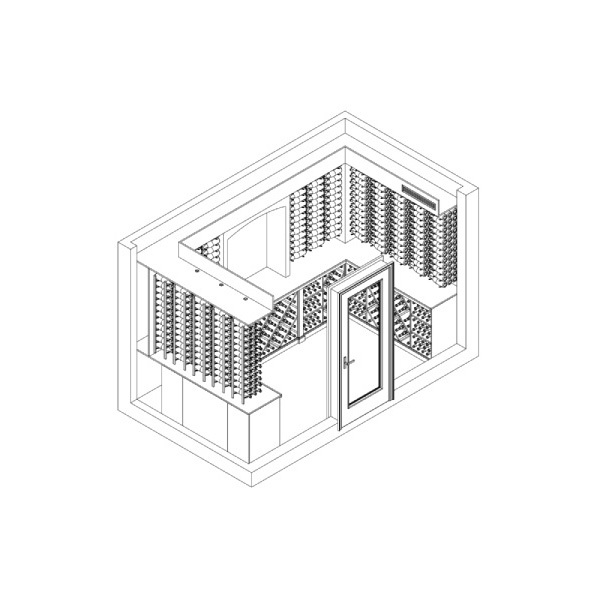 Designing wine cellars with metal racking generally means dividing the space into 13-15” columns. Rosehill carries a wide variety of metal wine racks and wine racking systems from single bottle holders to triple bottle racks and point of purchase displays for retail spaces. The wall peg wine racking system: a recent trend in wine racking is the peg system, which is when two metal pegs are placed in a cellar wall a few inches apart to hold wine bottles perpendicular or parallel to the wall. This modern wine racking shows off the bottle necks or labels and allows the bottles to appear as if floating on the wall. 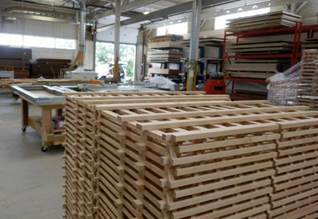 When boards are used they can include acrylic, stainless steel, black or colored facings. Back lighting is also often used with the peg system to great effect. Modular wine racks let homeowners create wine cellars anywhere in their home or business. Download our Do It Yourself – Wine Cellar Design Kit. 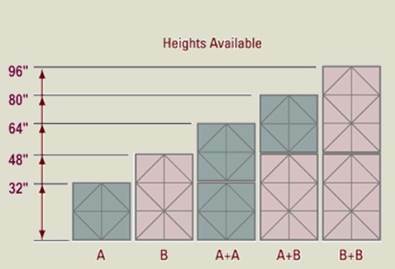 We've included "to scale" size modules of the modular racking and a grid to personalize for your own space. It's the "old school" way of cellar layout, but people still use it. The Modular Redwood Redrack is the least expensive kit option and it’s a perfect choice for temporary residences but also works when someone wants to keep more money for their wine collection as opposed to their racks. It is available in stackable heights. In designing, you don't need to use the cut out templates, you could also just to a quick sketch of what you were thinking, and we'd be happy to review. 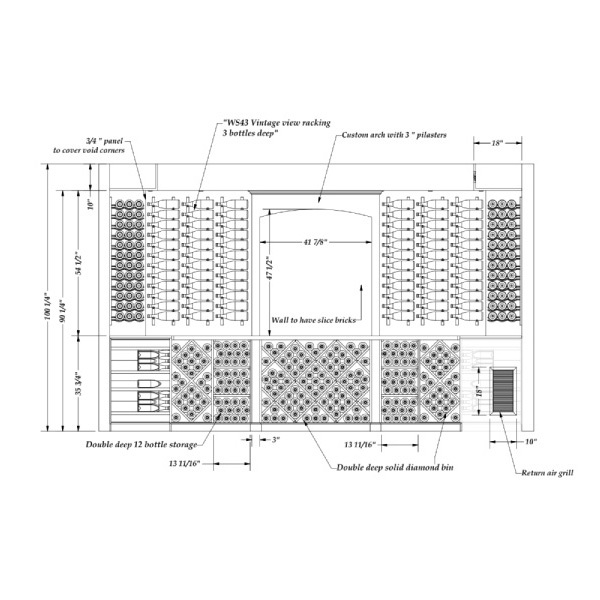 Download - Designing Wine Cellars with Modular Kits PDF for more information. Do you want Rosehill to review what you’ve done? We’re always happy to help curious crafts people create perfect cellar spaces. 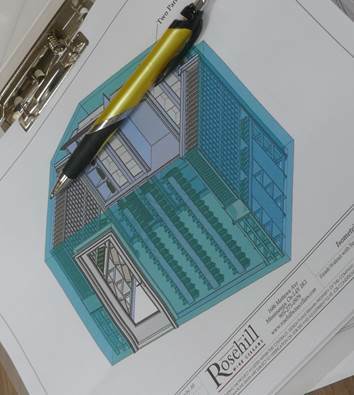 Contact Rosehill Wine Cellars at any stage in your project if you would like our experienced wine cellar designers to inspect your schematics. Show us your designs and we’ll help fill in the blanks, literally; our drafts people start designing wine cellars from the corners inward. Once you've spent some time envisioning what you'd like in your cellar, we’re always happy to provide an expert critique and even more suggestions. For a small fee, our shop will cut the kit racks for wine to provide a custom fit for your wine cellar measurements. Certain wine racks can be made shorter in height, or narrower in width. This will enable the wine racks to fit without gaps and provide a streamlined custom appearance. Home and business owners seeking to design and build their own custom wine cellar spaces can access valuable resources and tap into decades of experience at Rosehill. Our expert staff has many design tips and space saving equipment to help wine and spirit collectors craft their dream cellar spaces. Because each space is unique, there isn’t one central set of rules to follow when designing wine cellars. An array of unique circumstances combines with aesthetics & tradition to impact design. These factors include size, location of the wine cellar and climate of the designated area. Each wine cellar is distinctive because of these factors. 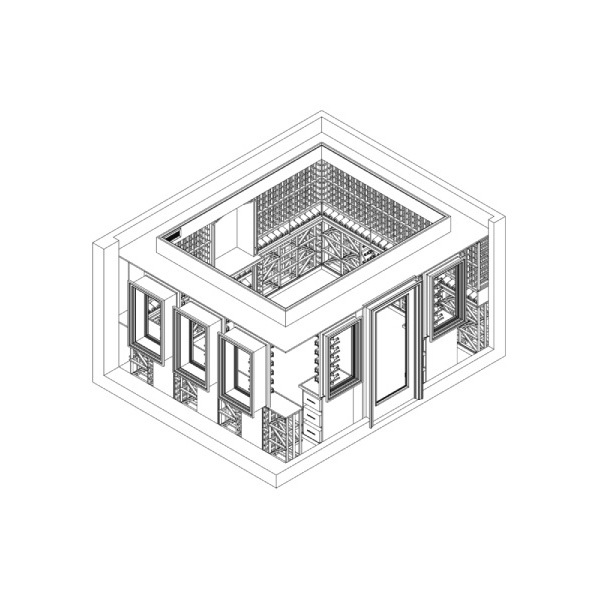 Yet the basic build requirements will remain the same and should be followed for optimal results. Wine cellars can be built anywhere and there are often small add-ons or installations that can miraculously transform a room section of your home or business into a more suitable cellar space. Once you and your building contractor appropriately gauge these many conditions, and you determine the size and shape of the wine cellar at the site, Rosehill can help finish the cellar by properly insulating the walls and ceiling and by adding any finishing touches to the cellar and the wine racks to best suit your collecting style. Visit our showroom to see hundreds of amenities for every cellar space. Rosehill Wine Cellars offers such insights and advice because our goal is to help provide you with the guidance necessary to make the best-informed decisions and to construct the most beautiful wine cellar possible in your home or business. Watch your wine cellar take shape in front of your eyes. Lastly all that remains is to stock your wine cellar with your most delicious wines from around the world.